A higher number of students have been taking summer sessions classes this year at CWU. The reason is, in part, the renewed availability of Pell Grant funding. 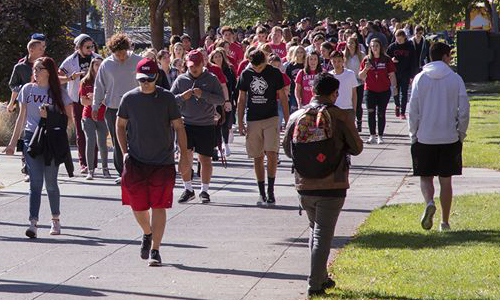 Preliminary estimates indicate that CWU summer session enrollment was up 7 percent from this same time last summer, noted Gail Mackin, CWU associate provost for undergraduate and faculty affairs. This summer, CWU experienced a 20 percent increase in the number of students taking online classes compared to last summer. Congress restored year-around Pell Grants last year, following curtailment of the program in 2011. The availability of grants for the summer term also contributed to the increased enrollment. The funding also provided added support for students who have responsibilities, such as jobs or family circumstances, which prevent them from taking a maximum class load during the traditional school year. “While the lifetime amount of aid a student may receive has not increased, certainly this year-round access to Pell aid can shorten a student's time to completing his or her degree,” O’Hare acknowledged.